This is a simple and easy to follow Recipe for preparing at home Stuffed Prawns Karanj. 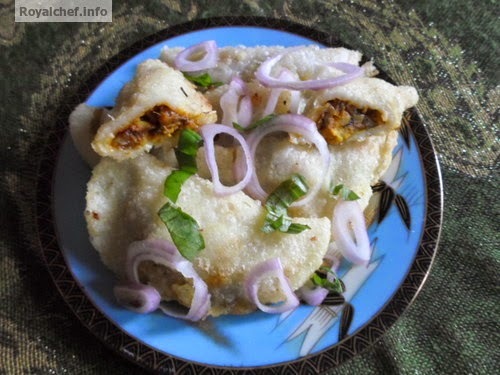 This is a speciality Maharashtrian Jhinga Stuffed Karanji preparation, a great Cocktail snack or even a side dish for the main course. Clean and wash the Prawns and then add the grounded Masala, Vinegar and Salt. Mix it well and keep for 20 minutes for marination. Heat the Oil in a Kadhai, then add the marinated Prawns, cook until they become tender, and then keep them aside. In a Vessel boil a cup of Water and then add the Oil, Salt, Rice flour and Refined flour (Maida) and then mix it well and cover with the stain less steel plate. Cook for 2 minutes on a slow flame. Remove the cooked Atta in a plate and prepare a Dough using with Water. Prepare small balls from the Dough and press on your Palm to make a small Puri and then add one spoon of the Prawn mixture and then close the Puri and give a Karanji shape, with your hand. Heat the Water in a Vessel and keep the Chalni on it. 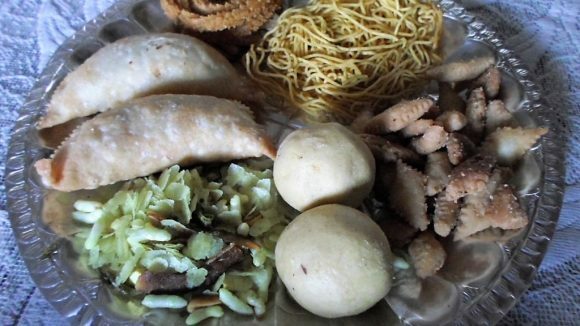 Keep a Banana leaf on the Chalni and arrange the Karanjis over the Chalni. Cover the Chalni with a stain less steel plate and give steam for 10-12 minutes. And then after remove the Karanjis from the Chalni and keep them for cooling. Heat the Oil in a Kadhai and deep fry the Karanji till color change in to golden yellow. Serve hot.